Lying on the bed in the dark and claustrophobic little cube of characterless room that was ours for the week, with a wardrobe unit around and over the bed, and with an overhead shelf to prevent you sitting up in bed yet ideal for cracking your head on in darkness, and a TV located seven feet above the ground which would put the crick in many of a neck, I did wonder whether this holiday was a good idea. The brochure said the hotel was in a 'slightly elevated position 900 yards from the centre of Garda', and discounted worries about being 'slightly elevated' by pointing out there was a free courtesy bus to town. What they didn't mention was the fact the bus finished at 7pm, sometimes didn't turn up, and the real distance I measured up the considerable hill was 1400 yards (and I have a good stride I used as a measure). But I'm not one to moan, as I'm sure you'll realise by now, so lets get on to the reason why even a few hotel hardships are so worthwhile in order to experience the charm and beauty of Lake Garda. This is the southern gateway to Italy from the Alps. Lying in a beautiful valley between tall mountains, with its micro-climate, olive groves, world-famous vineyards and stunning scenery, Lake Garda offers a delightful setting in which to laze for a week or so in the sunshine alongside Italy's largest lake, being 51.6 km long, 4 km wide at the northern end, and 17 km wide at the southern end. You would cover some 160 km if you drove around it. Many would say this is Italy's most beautiful lake. It is a sun trap that lies between the Alps and the Dolomites. The north is bordered by perpendicular cliffs covered with pine forests, and the southern part widens such that the farther side of the lake is hardly distinguishable with the naked eye. The southern part of the lake has an almost Mediterranean climate. Boats and hydrofoils ply the lake and the Italian cities of Verona, Brescia and even Venice are within easy reach for day trips. Now our experience with the hotel was not uncommon, and it should be noted that the majority of hotels are small, often family-run, and they do not offer the room size or scale of choices you might expect to find in other Mediterranean destinations (such as Portugal or Spain, for example). Buffet breakfast is often limited, air conditioning is controlled by the government, and facilities often tend to be minimal. If all this is a big put-off, weigh against it the beauty of the place for, in my opinion, this more than compensates simple living for a week; and a week, is probably just about long enough to take in Lake Garda — unless you are looking for a place for a major 'chill'. And don't think the food is poor just because breakfasts might be limited; in general, the food everywhere is fresh and of a high standard: some say it is to 'die for' — although I feel this is a rather unfortunate way of putting it. In the main, it is also very reasonably priced, as are drinks. And how wonderful to be trusted and to have open tabs without the risk of losing sight of your credit card. 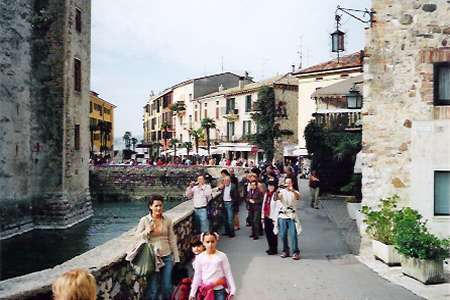 Anywhere you go on Lake Garda has great eating places, wonderful food and a great café culture. You can taste the freshness of the food in every bite; people go out each day to get their bread here, so it is without preservatives; these are not supermarket imitations engineered to 'last'. Taste what food is really about — and what you have been missing. Immerse yourself in the true café culture, adjust your speed to tick-over like the residents, enjoy the slow pace of life; it is not often that modern living allows for this. Is this not what you came to Lake Garda for, anyway? (What? You wanted some night life? 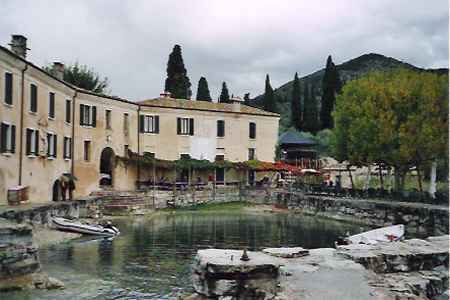 Then look at some other destinations, my friend, for Garda is rather too tranquil for that.) Yes, it has to be admitted, the average tourist age is rather high around these parts, but don't let any lack of age prevent you from discovering these beauties; although, this said, I would not recommend this as a family destination. Why take your kids to break the tranquility? It will not be appreciated! Where you stay on Lake Garda affects whether you can add 'peace' to your list of benefits. 'Place = pace' around these parts; some buzz more than others. We went at the end of September — the end of their holiday season — and we saw it at its quietest before places close and the scene becomes quite different. And, guess what, we got a dose of rain and cold from Day 1. (Well, you know my luck by now!) After weeks of sun and no rain, from the day we arrived, we had three days with serious periods of rain. But then the sun came out properly and it was a different place. Looking across a huge expanse of water on a rainy day and looking across a huge expanse of water on a sunny day are two completely different experiences; I would recommend the latter. We had come from England where, after the dreadful summer in which a sunny day was remarkable, we found ourselves in a place where a rainy day was remarkable. We chose to stay at Garda itself and, I think it, was a good decision — for us. 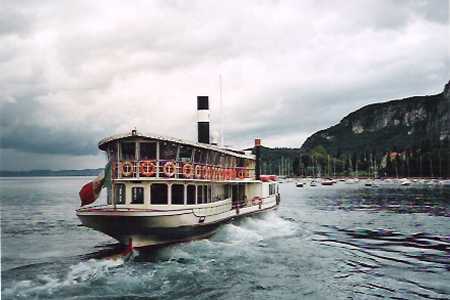 If offers good boating links, easy bus access to Verona and the eastern lakeside towns; the Verona-Riva bus link is a relatively fast and inexpensive way to travel — with beautiful lakeside views thrown-in for much of the route alongside the eastern shore via Bardolino, Garda, Malcesine and Torbole. Of the places we visited around the lake, here's my quick overview: Garda, on the eastern shore, is laid-back and tranquil and well-placed for communications; Bardolino, a couple of miles south of this, is packed with accommodation and camp sites and is a bit more up-marked in the way of shops, but busier; Sirmione, on the southern shore, is heaving, very tourist-based and a strange cross between quaint and tourist-tacky; Malcesine, on the eastern shore but near the north end of the lake, is quaint, cobbly, bustling and atmospheric. 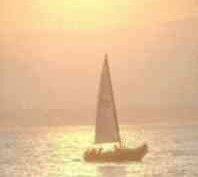 Of course, the most romantic way to get from place to place around the lake is to use the boat and ferry services - even if this does require great patience and forbearance in order to understand the data that provides you with times and prices. So a word or two of explanation of this formidable timetable — you can get paper copies or study large copies by the departure points — might he helpful. Read and remember! The two parts of the timetable show lake destinations from south-to-north and north-to-south. Once you know whether you want to go north or south, select the appropriate timetable, find your departure point, look across for a suitable departure time, check down to ensure the boat goes to your required destination (if not, find a different time and repeat), note your arrival time. Whether it takes 20 minutes to complete your journey, or two-and-a-half hours will depend on the route it takes, so beware of this! To find what it costs, look at the intimidating 'tariffe' chart and find the number that aligns with departure and destination, then use this number to discover the cost in the tariff chart; black entries are slower, cheaper boats, and red entries are high-speed, more expensive ones. October to March is the low season with fewer boats and a different timetable, so if you are there for a period which bridges high- and low-seasons, make sure you use the correct timetable. You do need to plan your trips on the lake for boats suitable for your chosen destination might not be as often as you imagine, and you might not appreciate getting stranded, so plan your return trip as well as your outbound trip. The boat services pride themselves of keeping good time — to the minute, in my experience — so marvel at this when you travel! Getting people on and off the boats is a well-rehearsed exercise and it is done within about five minutes. The gentleman charged with this responsibility at Garda was quite fierce about pre-inspection of tickets and getting people in orderly lines; you shall obey if you wish to get a boat! While we're on transport, if you go by bus, it is best to buy your ticket at a bus station or tobacconist; if you want a return you get two singles. You 'validate' the ticket by putting it in a slot on the bus when you get on. You can buy a ticket on the bus but it will cost more. Okay, that's the general stuff over, now let's consider some of the locations and potential trip destinations. Garda itself is a charming, gentile, genuine little place with a splendid promenade with countless cafés offering food and drinks at reasonable prices; you could move from one to another all day, choosing from seating within their walls, their near tables, or their far tables across the walkway, closer to the water. 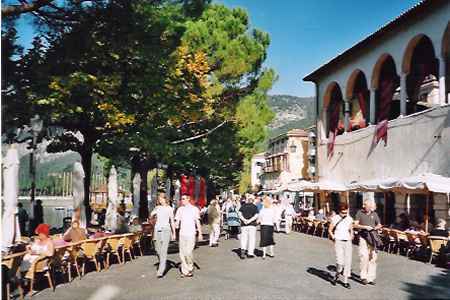 Within the town itself there is one main drag, a narrow paved street with its shops and cafés. Apart from the main roads through the town, the shopping and eating areas are pedestrianized — ideal for relaxed strolling. The main products you will see for sale are leather, china and wine. The calf-leather is of high quality and reasonably priced in the Lake Garda shops; a great place for an otherwise expensive leather jacket, handbag or shoes! A great place for classy presents. 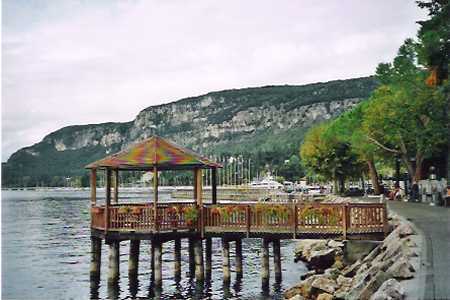 Garda is a perfect blend for both tourists and inhabitants. 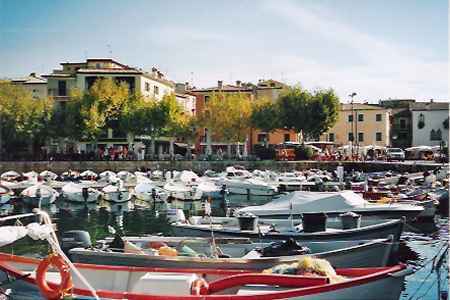 The little harbour at Garda shows the local preoccupation with the water and includes several serious fishing boats. If you enjoy fish, then it is caught fresh here and served quickly to your plate. What surprised me was the lack of yachts on the lake, it was almost deserted. But, then again, remember the Italians have a long working-day, with their siestas, and it is mainly on Sunday that you see the locals out and about, usually with their families. But the real charm and memorable times in Garda lie in the lakeside promenade, among its café tables, seated with such a wonderful view before you, a menu of dishes and places to visit before you, choosing whether you want sun or shade, whether you want a great Italian meal or a fantastic ice cream, deciding how long to stay, maybe enjoying the table by evening candlelight. One guitar-strumming entertainer on Tuesday evening, with an accent and appearance that seemed to hark from the Rockies, churned out an endless but professional stream of hits from the past, country music, rock, Elvis, even Sinatra —you name it, he could do it. He spoke great Italian, as well, maybe was English, but his nationality remained a mystery; his music did not. Oh yes, and the open area nearby, on the promenade, was the venue of several concerts. Garda has a lot going for it. Walk to the north along the lake and you eventually reach Punta S. Vigilio. This walk is mainly along a fine pebble path alongside a favoured quiet beach, and it ends at a delightful little bar attached to an expensive hotel, where you can relax and enjoy a drink or meal beneath a leafy pergola alongside their delightful little harbour. The extracted €13 here for two milk-shakes — nearly double the price you might pay in Garda itself — so be warned to check out the prices; coffee was more reasonable, though. Whatever the prices, after this walk on a hot, sunny day, you'll be pleased to pay the ransom. Walking south along the promenade from Garda to Bardolino is an entirely different proposition; much easier, although, it has to be said, it is a fair walk; a couple of miles, at my estimate. (You could take the bus if this is not for you.) You pass countless caravan and camping sites on the way but, thankfully, they are well hidden behind hedges and the lakeside is alongside your walk all the way. 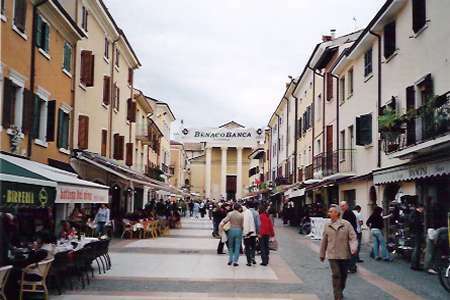 The place is world renown for Bardolino wine, and the day we took this walk was the day of their wine festival. It was heaving with people at the various stalls offering all manner of wines; the pros had red, dangly glass-holders around their neck so they could sample the wines from their own sanitized glass. The town itself has the air of a small Italian city about it, although it will not take you long to see the sights. It aims fairly obviously at the visitor. 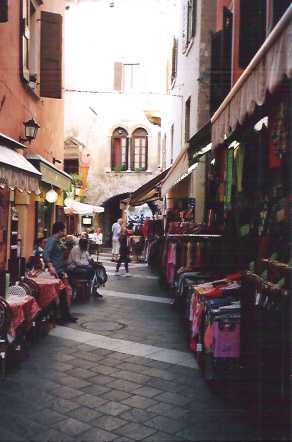 Rather than the narrow streets of Garda you will here find wide pedestrianized thoroughfares, as in the picture, with the church at the end of the main street. As everywhere on the lake, you will have no trouble in finding an eating establishment! Call me old fashioned, but I must confess to finding Sirmione rather on the tacky side: beautiful made bad. True, there is an excellent old town at its heart, with its splendidly imposing little castle, and there are lovely areas — but the tacky shops and heaving roads cancel the delights to my mind. The little roads heave to the uncomfortable juxtaposition of human flesh and cars. The problem is inherent and lies in the fact the town is located on the end of a narrow promontory of land. There is one road in and a considerable number of hotels located at the end of this land mass; in the middle, lies the castle — Rocca Scaligera — and old town. See the problem? Cars plying to and fro between the entry road and these hotels have to battle through streets only one car wide; and pedestrians have to battle through the same streets without getting run over. Then there are the shops, and this is the place for truly tacky gifts, typical tourist-style. This is not to say there are not some beautiful areas to be found in Sirmione, plus the usual wide choice of eating places, but it is just that moving between them is a bit of a nightmare. Given that we visited at the end of the season, and found it heaving with visitors, I hate to think what it is like when it is really busy! I guess the best time to catch this town is in the winter when the tourist nightmare dies down. I think you pronounce this place "Malchesnee" but don't quote me on this; lots of visitors seem to struggle over this one. Certainly if you pronounce it "Malkeseen" you will not be understood! This is a delightful little town towards the narrower northern end of the lake that oozes with cobbled character. Set on a hill, or rather the slopes beneath the mountain of Monte Baldo, it has the same kind of shops already described, but more than at Garda, and with more character. But if climbing up and down cobbled alleyways (pedestrianized) is not your thing, then stay away. The heart of the town is like this. If this is not a problem, do not miss this pretty little town! Since this is where Lake Garda narrows, it is possible here to actually see a bit of detail of what lies on the opposite shore. You can actually pick out individual houses here, where in the southern part of the lake, the far side lies on the horizon. Yes, the lake is BIG. 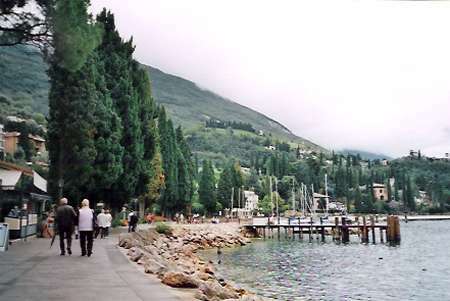 The strange thing is that because most of the buildings actually lie right on the lakeside, in the centre of town, it is hardly possible to do much more than get occasional glimpses of the lake apart from the little harbour shown here — with cloud-ridden Monte Baldo looming up in the background. 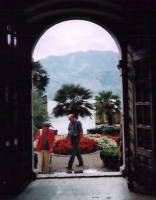 I spoke to other people who had visited Malcesine who never discovered there is also a pleasant promenade there. They bemoaned the lack of lakeside, but walk along the tree-lined street to the left, when facing the direction of the lake, and you eventually find this pleasant area offering good views across the lake and up onto the green slopes of the mountain. Talking of the mountain, you can get a revolving cable car from the upper part of the town to the top of Monte Baldo in just ten minutes. If you are the somewhat energetic type you are allowed to take your mountain bike or paraglider up with you. Personally I prefer the idea of the rotating cabin to either of these methods of descent. 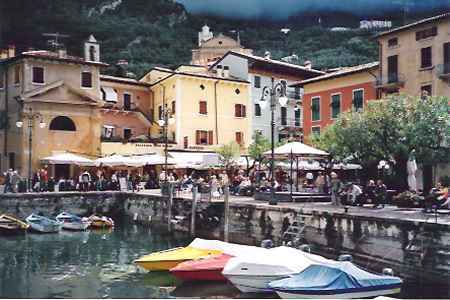 Another popular tourist destination at the north end of the lake is Riva del Garda. I didn't get there, but it is noted for its gardens and promenade areas. Why pass up the chance of seeing some real mountains when sandwiched between such tall ones? We chose the 'Grandi Dolomiti' day tour that took in all the wonderful mountain scenery of the Italian Tyrol and ended up at the snow level in the Dolomites. Typically the mountain slopes are clad with pine forests until, at around 2,000 metres, this gives way to shrubs and eventually just bare mountain rock. 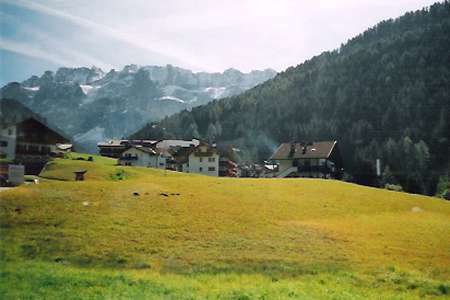 In the valleys, however, rich with water from the snow caps, sheltered from the worse winds, there you will find lush pastures, wild flowers, and settings like Switzerland, easy on the eye. Now you must understand that living in the mountains is not a bit like living anywhere else. For a start it gets very, very cold in the winter. Secondly, it is expensive to get energy to the houses/cabins. Thirdly, it is hard to see much of life — other than the wonders of Nature around you, and the same old people. So even finding someone to marry is a difficult job. But they have that cracked in the Tyrol. The answer, of course, is a blue apron. (Why didn't the rest of us think of it?) The older generation of men wear a blue apron to signify if they are 'spoken for', but they turn up the corners of the blue apron if they are 'available'. Now this is not just on a 'blue apron day' as you might expect, but all the time! I guess they cannot pass up the opportunity of missing out on a passing tourist that would suit. Cold is as cold gets in the mountain cabins, and wood is the cheapest and most sensible way of warming them; always has been. So the traditional scheme was to have a central 'tile oven'; the service part of the oven, in the kitchen, did the cooking, but the rear of the oven projected into the family room as a tiled cube that radiated delicious heat. It made sense to heat the one room, you see, and to heck with the rest of the place. I saw an example of this that included a wooden structure right on top of the tile oven that used to be a bed; I don't suppose they complained of the cold at night! Alongside it were seats, for daytime enjoyment. Windows are small, hereabouts, to minimize heat loss. Our uppermost vantage point offered a cable car to reach yet further viewing and paragliding heights — imagine jumping off a mountain thousands of metres high if you will (and we saw plenty doing it) — but the view was just great even without this extra ascent, and patchy snow was underfoot. 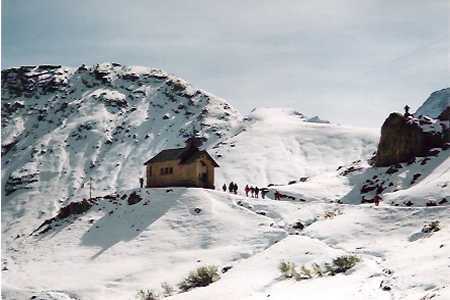 The picture shows a remote little church high in the Dolomites. Some of my favourite travel memories are the beauties of the mountains and valleys in Switzerland; the Dolomites have the same appeal. And to be near to such scenery in the virtual Mediterranean climate of Garda is a fantastic bonus. In fact, to use a recently learned Italian word, it is fantastico! including general information about the country. If you enjoyed reading the above article then you will probably also enjoy Mid-Wales by Ed, and Paris and The Louvre, also in Europe, and our latest articles covering the Orinoco Delta, La Mata, Marbella and Beijing.